The choice of a reliable broker offering the most favorable terms of cooperation is the main task of every novice trader. Unfortunately, in this case, there is no universal algorithm that allows to distinguish fraudsters from decent participants in the global financial market. Therefore, many newbies often fall prey to swindlers and lose interest in online trading forever. In order to avoid such problems, it is necessary to carefully analyze the key performance indicators of the broker, using reliable sources of information. Do not blindly trust reviews on the Internet, if the author does not provide real evidence of fraud. Before starting to study the service, you need to carefully check the “black lists of brokers” and find out the real “age” of the company. The last indicator is very important, because fraudsters are trying, as soon as possible, to turn their scam and forever leave the already unnecessary web resource. Using the example of the well-known LiteForex trading platform, let’s see what characteristics of the service indicate its reliability and readiness to fulfill its obligations. 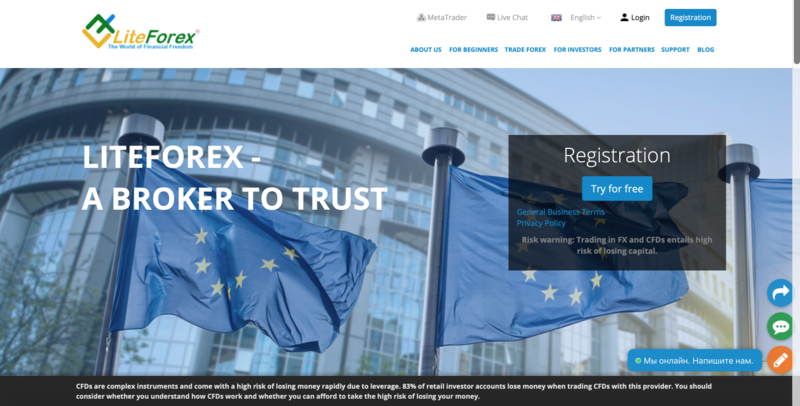 The represented company (more precisely, two legal entities – LiteForex Investments and Limited Liteforex (Europe) Limited) began its activities in 2005. From the first days of its existence, the broker used non-standard methods to attract new customers. To do this, the creators of the service have developed a system of cent accounts and reduced the minimum amount of the initial deposit to $ 1. As a result, the company for a short period of time, becomes known in almost all countries where they were interested in trading in the Forex market. Hundreds of thousands of users had the opportunity to engage in online trading without fear of fraud or other unpleasant “surprises” from the administration of the resource. The company in question has been providing financial services for more than 10 years. During this time, hundreds of thousands of traders from almost all corners of our planet became its clients. Applications based on MT4 and MT5 platforms created for LiteForex allow you to work on the broker’s website using mobile devices or a regular computer. At the same time, users do not have to worry about the safety of funds or personal information. Traders’ deposits are stored in separate accounts, which allows you to finish trading at any time and receive your money. Additionally, to ensure the safety of the client’s funds, insurance and protection against negative balance are applied. 1. Marshall Islands Business Corporation Act. 2. MiFID (Directive on markets and financial instruments). 3. The rules of the Cyprus Commission on stock exchanges and securities (CySEC). This is quite enough to safely register a login and make trade and financial operations at LiteForex. In the “Beginners” section of the company’s official website, you can find training materials that will help beginners understand how the global financial market functions and what needs to be done to turn it into a source of profit. With the help of a general educational program, e-books / textbooks and a glossary, even a person with a zero level of training can obtain the necessary theoretical knowledge. After that, you can proceed to the study of trading strategies and indicators (these sections will interest not only beginners, but also experienced traders). Practical training of resource users is carried out using a demo account developed by LiteForex specialists. This tool allows you to see how deals are made, how much their performance depends on the trader, what mistakes they most often make, etc. ● CLASSIC. Trading account with a minimum deposit of $ 50, no commission, with a floating spread of 1.8 points. ● ECN. The minimum deposit of $ 50, interest is charged on the balance (2.5% per annum), the maximum amount of commissions is $ 5 per lot, a spread of 0.1 p.
Regardless of the type of accounts chosen, traders can copy the deals of successful colleagues (social trading). ● The minimum deposit amount is $ 50. ● Currencies: euro, Swiss franc, US dollar, Russian ruble. ● Minimum transaction – from 0.01. ● Leverage – 1: 500 – 1: 1. ● Islamic account – is. ● Maximum contract size – $ 100 thousand. ● Personal Manager – provided. Many traders leave positive comments about LiteForex, focusing on the large selection of trading assets offered by the brokerage company to its customers. Their list includes: currency pairs, precious metals, raw materials, indices, cryptocurrencies, CFD contracts. Based on the above information, we can conclude that the broker is a reliable company, which is simply not profitable to break agreements with its customers. A good reputation in this business costs much more than a few thousand dollars saved by traders.